Get Stoked because Mount Sunapee just got Approved for an Expansion! Get Stoked because Mount Sunapee just got Approved for an Expansion! Get Stoked because Mount Sunapee just got Approved for an Expansion! Newbury, NH – (April 6, 2016) – On April 6 the Governor and Executive Council of the State of New Hampshire approved a decision by the New Hampshire Department of Resources and Economic Development (DRED) to allow Mount Sunapee to move forward with its West Bowl Expansion. The West Bowl Expansion will add 56 acres of skiing terrain down the west flank of Mount Sunapee into the town of Goshen. There will be four top-to-bottom runs serviced by a 5,100’ high-speed quad chairlift. The terrain will be primarily for intermediate and advanced intermediate skiers and snowboarders. All of the trails will be serviced by snowmaking. The West Bowl will create another entrance to Mount Sunapee Resort approximately two miles up Brook Road off Route 103 in Goshen. The base area will have a modest base lodge, parking and a beginner area serviced by a carpet lift. “We are pleased with DRED’s decision which we believe thoughtfully balances conservation, recreation and economic vitality, and recognizes our efforts to be good stewards of Mount Sunapee,” says Jay Gamble, vice president and general manager of Mount Sunapee Resort. 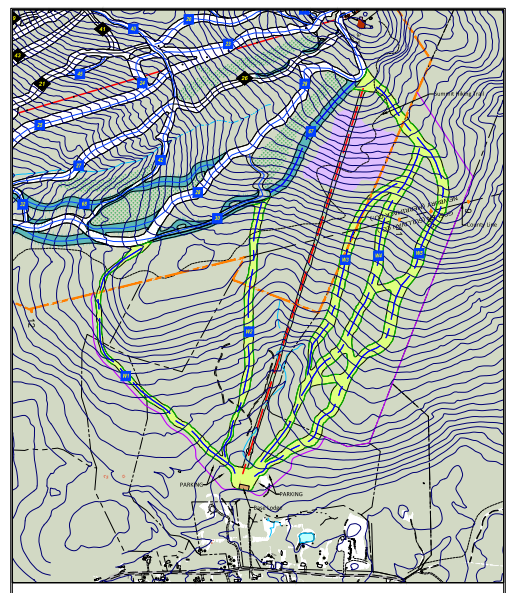 The West Bowl Expansion is part of Mount Sunapee’s Revised Five-Year Master Development Plan which was submitted to DRED in June of 2014. There has been strong local support for the expansion. In March of 2014 the Town Of Goshen voted to create the Mount Sunapee Recreational District at their Town Meeting, which is zoned to accept the West Bowl Expansion. Selectmen from five surrounding towns submitted letters to DRED supporting the Master Development Plan. “This decision by DRED will ensure that Mount Sunapee Resort will remain competitive with other New Hampshire and New England ski resorts and continue to be a strong economic stimulus year-round in the Lake Sunapee Region,” commented Gamble. As part of the approved decision, 150 acres outside the current Mount Sunapee State Park boundary that include segments of the trails, lift and snowmaking for the West Bowl Expansion will be added to the ski area leasehold within the Sunapee State Park. Another 260 acres will be donated by Mount Sunapee for conservation lands along the Sunapee-Pillsbury corridor. A total of 410 acres will be added to the Mount Sunapee State Park. Read the approved decision and view maps of the expansion. For more information about Mount Sunapee Resort visit www.mountsunapee.com. Here is the map they’ve posted showing the proposed new trails. Click on it to view more details.